In the Internet Age, people are used to having near instantaneous access to information. Thanks to sites like Wikipedia and search engines like Google and Bing, the answer to all matter of trivia question is limited only by the processing power of the device used and the speed of the connection. 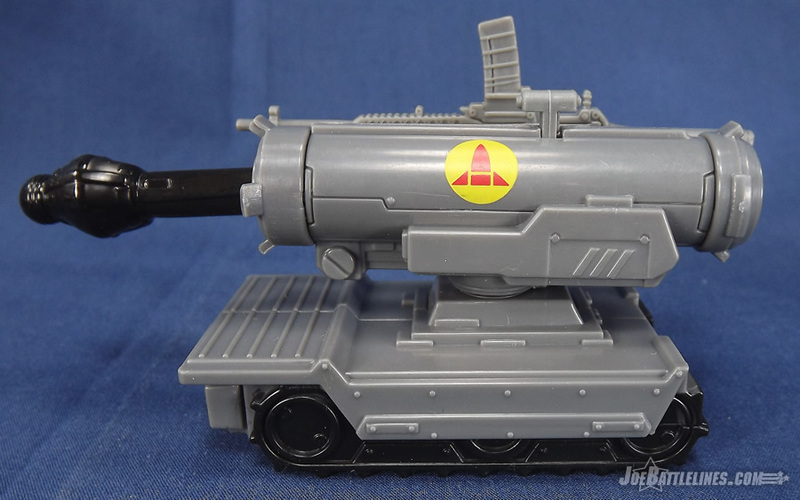 However, this wasn’t always the case—such as when first acquired the “mystery figure” that would eventually be called “Bombardier” back in 1999. 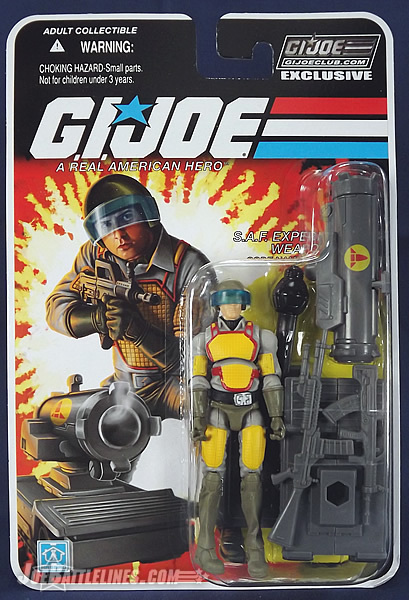 Back then, no one in the fledgling internet Joe fan community knew anything about this figure’s identity or when he came from. It would take 10 years for this mystery to be solved and it would involve individuals on two continents. It almost makes for a perfect selection in a premium subscription-based G.I. Joe figure line that is designed to highlight figures that wouldn’t otherwise see production. Ladies and Joe fans, meet the long lost “blonde Flash”—Bombardier! 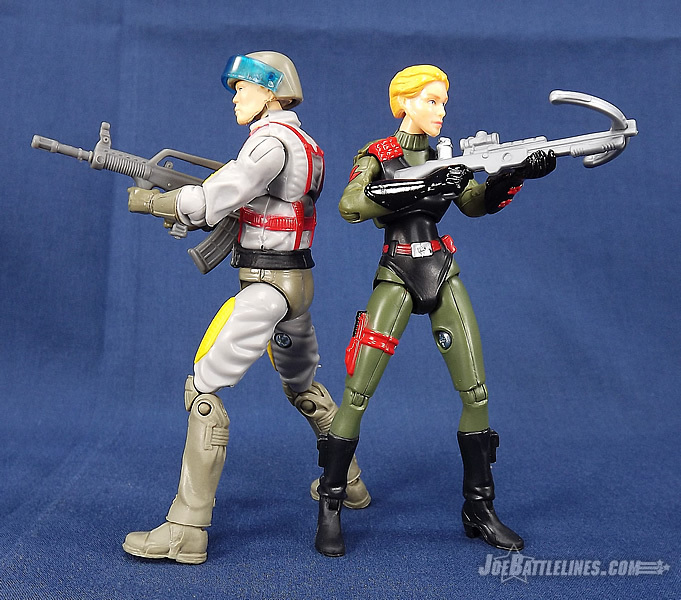 As always when it comes to FSS figures, I’m joined again by Chris Chung of JoeSightings.com. Chris’ comments will appear in bold while my own will be stuck in regular old plain text. 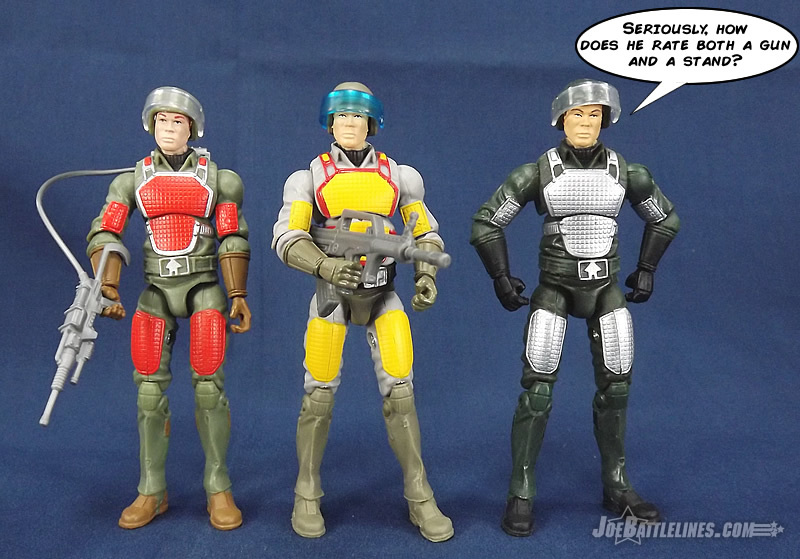 NOTE: If you’d like to learn more about the history of the figure now called Bombardier, visit the “Mystery Figure” article over at YoJoe.com ! There’s a saying that’s “What’s old is new again” and this certainly holds true with Bombardier. 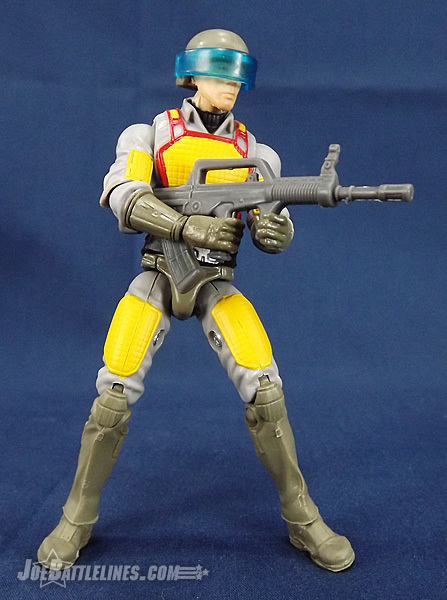 Much like the original prototype, every single piece of this figure was used before for the 25th Anniversary Sgt. Flash figure . As such, Bombardier has all of the strengths and weaknesses of this figure that was released in the 2008 Wave 1 series of the 25th Anniversary figures. Rather than rehash all of my comments, I’d refer Joe fans to revisit the original review I posted over six years ago. So, if the body is the same—what’s different about this figure? That’s easy—just one look at Bombardier and you’ll see a radically different color scheme that that used for either Flash or Grand Slam. 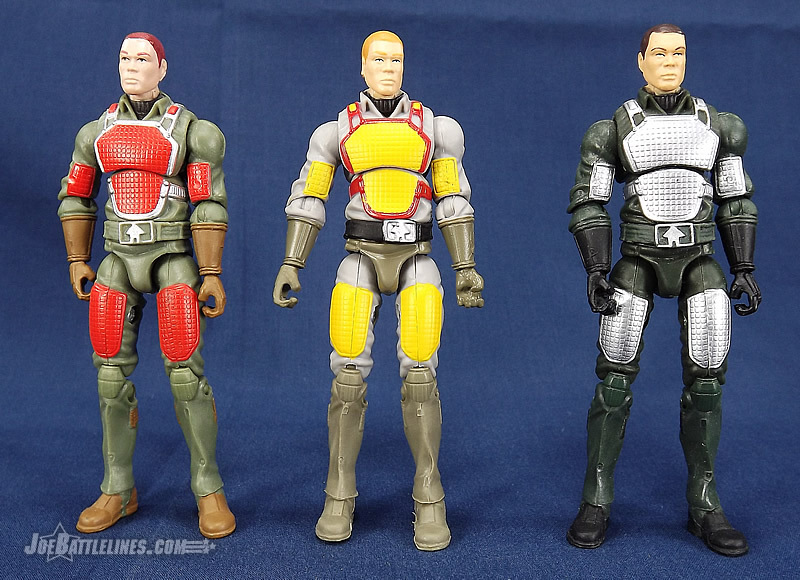 The overall body, as was the case with the original source figure design, is now light gray with only the gloves, knee pads and lower legs molded in olive drab. The sculpted pads on the thighs, biceps, and chest are now painted yellow with the chest pad featuring a red trim. The figure’s belt is molded black with the Hasbro symbol… uh… belt buckle painted silver. It’s a color scheme that, as stated before, pays homage to the original design and also helps to provide some much needed contrast from his “body twins”. On my particular figure the yellow paint seems to be a bit thick but only on the legs. Considering that this body has been used in this exact form three times now, this figure may not seem “exciting and new” but I get what the folks at the GIJCC were going for. This was a chance to recreate an interesting “concept figure” with no new tooling and, in the respect, Bombardier succeeds wonderfully. Chris, what’s your take on this particular figure’s body design. As for the Flash body, yeah, not much choice but to use that---duh! But it’s a dated figure whose time has come and gone. Sure, five or six years ago the Flash body was cool because it was new, and he was a sought-after member of the O-13. But the intervening years have not been kind. Like when many of us thought freakish proportioned Valor vs. Venom/DTC figures were great, Flash was an evolutionary leap over those toys, but now he's a dinosaur and a has-been since the franchise has made FTL jumps in design and presentation with PoC. So even if he was once cool, he isn’t so much now. His head is tiny, his facial expression is sour, and we have the very lanky legs and too-short arms that have movement limitations, so there has been zero improvement on the figure. But hey, look on the bright side; he isn’t a dwarf this time around. Personally, I really like the inclusion of the drone, missile-firing gimmick and all. Let’s face it—anyone tagged with “weapons development” and “experimental ordinance” these days is going to have some form of contact with a drone. 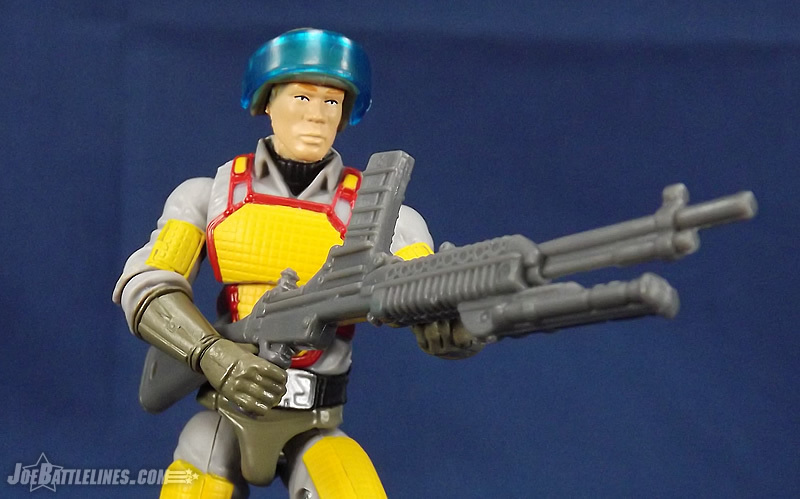 The reuse of the Rise of Cobra accessory fills this roll nicely. Will I ever use the missile-firing gimmick? Probably not but that’s just me. I also like the painted SAF logo on the side. It’s a nice touch and adds some needed detail to the drone. In terms of the rifles, well, that’s where I was hoping for something a bit more. 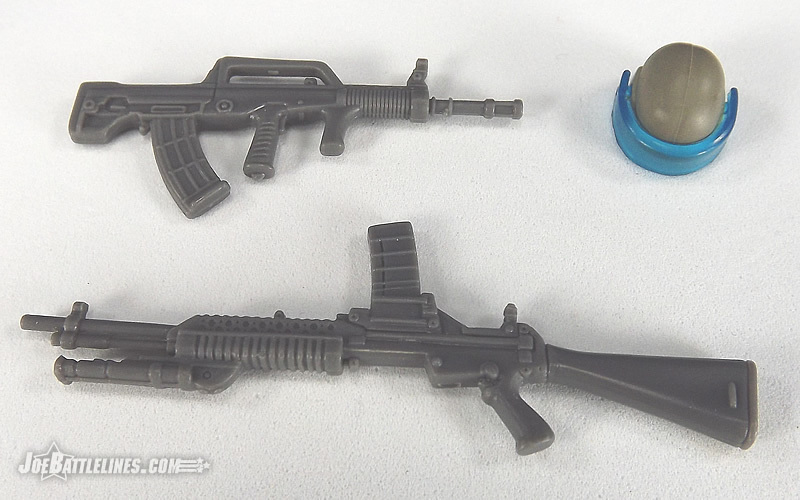 There have been some interesting experimental and prototype weapons included with various G.I. Joe figures in recent years that would have made a more interesting inclusion here. 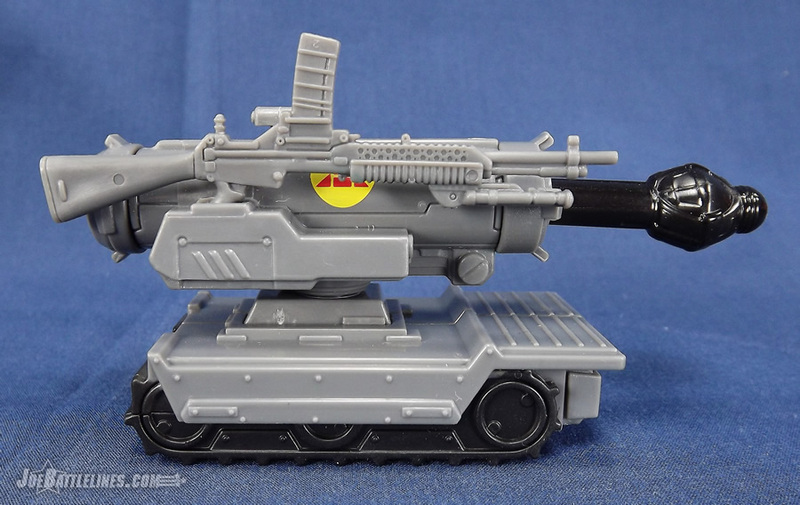 I’m reminded of the XM-8 that was included with the Rise of Cobra Sgt. Flash figure—a prototype rifle that ultimately was cancelled during development and testing. Instead poor Bombardier is given two weapons that look and feel over-sized to me. He’s not able to hold them in anything resembling his card artwork and that’s a real shame. Chris, what are your thoughts on Conner D. Tree’s kit? The RoC P.A.C. R.A.T. is cool, so kudos for that. The Bren was a pre-World War II MG retired in the early 90’s---but it fits on the drone; and it’s a British weapon, so it works. The QBZ-95 is an odd choice (not that he can even hold it as intended), but I don’t think much thought went into his weapon selection except for “Use RoC Ripcord’s accessories”. But then again, I see this guy more of a “fobbit” in the weapons lab, not out on the field, so that can excuse his non-tactical demeanor and his inability to properly wield a rifle. If you’ve been reading reviews that I’ve written for a while now you just might notice that I skipped the figure’s head sculpt. Considering that this figure is a top-to-bottom repaint, there’s no reason to waste space on it. However, I’m going to repurpose that page real estate to talk about something else—the character’s file card. 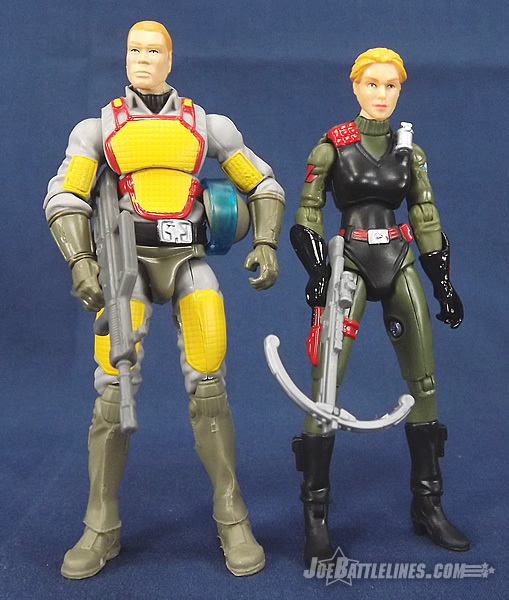 These have been missing from a great many new figures released by Hasbro over the past few years and it’s good to see that the Club has included them in the FSS figures. 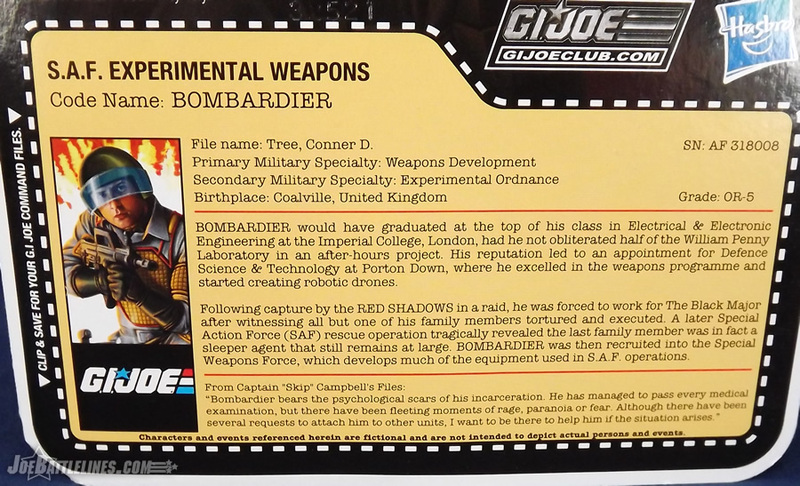 However, unlike the heavy-handed “wink-wink” piece that was written for Skullbuster or the near-Messianic tome that was Sure Fire’s, I really like the file card for Bombardier for a variety of reasons. First, there’s a nice nod in the character’s file name to the two individuals who helped bring the “mystery figure” to light—Ron Conner and Dave Tree. Yes, the file name was a nice nod, especially since it wasn’t Club staffers this time around. Secondly, the file card takes what was essentially a Flash repaint and breathes some real life into him. Thirdly—the file card actually tells a story which is something that the best ones always did. Bombardier was a reckless individual who was eventually abducted by the Red Shadows and made to watch his family die. He was put through an experience that has left him mentally-scarred and even acknowledges that he’s not a perfect soldier and that his command has some concerns about him. In those few words, Bombardier not only became a character but he became a sympathetic character. He’s someone about whom I’d like to find out more information. This is an individual whose story isn’t finished yet and that raises him about the status of “exclusive repaint” and places him about the Hama-era G.I. Joes in my opinion. Chris, I know that you’ve discussed the card art and file cards before—what are your thoughts about this release? The file card is fine. Perhaps a bit melodramatic in the tragedy department, but it’s interesting to see a guy who is “damaged goods” and isn’t fully trusted because of his mental demons. I’ll admit this right now—I like Bombardier. Is he a perfect figure on par with the recent Nocturnal Fire convention set from the G.I. Joe Collector’s Club? No—he’s based on some now-dated 25th Anniversary tooling and therefore inherits all of the weaknesses that were found back then. However, he is an interesting character to me—both for his history in and out of the G.I. Joe mythos. 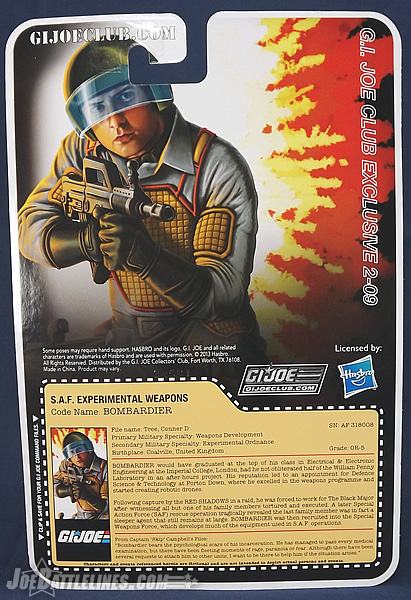 Bombardier is what I want from future FSS inclusions— a figure that wouldn’t have seen release otherwise and that has a story behind it. In my eyes, this release is more than just a “Club figure”—he’s a small slice of G.I. Joe history made tangible and that’s exactly what a “Club Sub” should be about. Sure, folks can argue he’s a bit of a “fan service” to two individuals but in this case it’s more of a hat nod that any form of nepotism. Now, is every Joe fan out there going to want him? Probably not—but for those of you that find both his real world and back story interesting I’m going to go ahead and give him a hearty thumbs up. 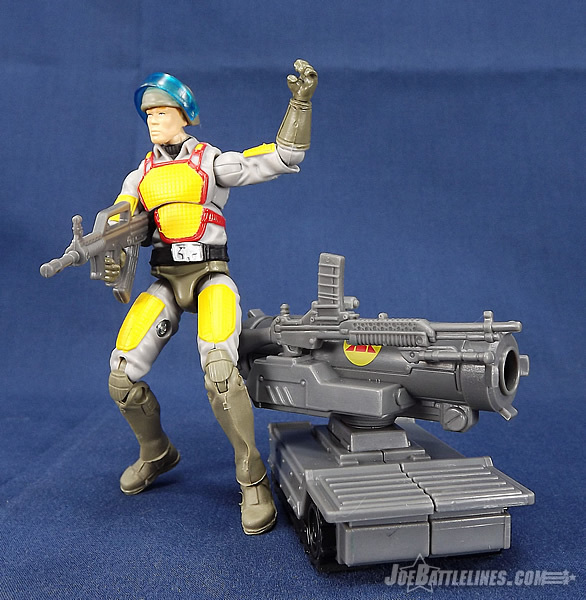 I like the figure and will proudly display him with my Joes. 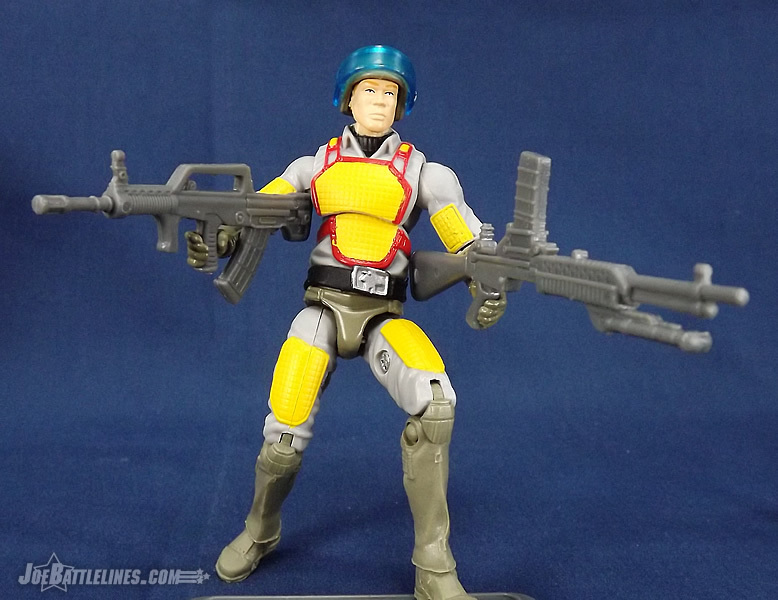 The Bottom Line: A great example of how the GIJCC can take “another repaint” and breathe some life into him. Recommended by this Joe fan! Chris, do you have any closing remarks? My friend, we have to part ways on this one. If you’re a fan of Action Force or are one of the U.K. collectors, then sure, this is a bone thrown to you, and that’s cool. 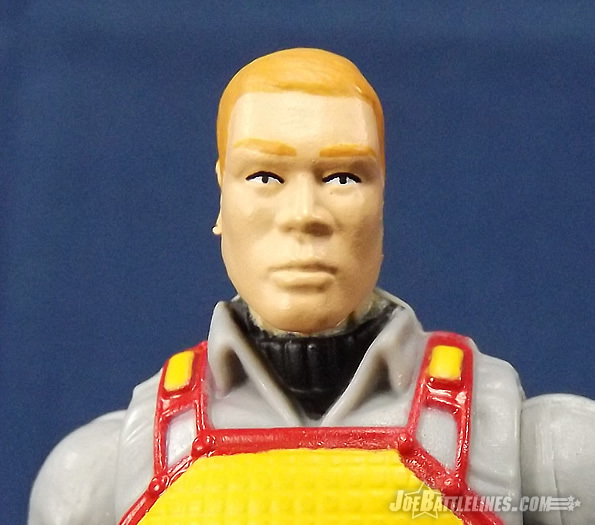 However since I am neither, I see this more as a wasted opportunity, and here’s why: (and I fully admit I could be in the minority), but despite the former mystery surrounding the physical toy, Bombardier-the-character was never a G.I Joe team member. He was essentially a “pretend” character ret-conned in to fill a very specific need for the Club, and that was to alleviate the hyper-rarity of the original and to give fans easy access to him now without dropping tons of cash. In that regard I can understand the action. After all, if this was something I was keen on, I’d also want an opportunity to have one even if it was new instead of old. So I get that. But on the other hand, there are dozens of real, canonical, official G.I. Joe characters who exist in the cartoon and comics who have never been made, and I personally feel real ‘Joe and Cobras should be made over characters that were never apart of the brand to begin with. As for the figure itself, he gets a plus for being a new character instead of another rehash, but those same points are taken away because he’s one of the laziest and easiest figures the Club has ever made. When we remove all the mystery, history, and everything in between, all he boils down to is an uglier repainted Flash that is no better or worse than any of the custom versions out there, except this Flash will cost you almost $40.00 before scalpers hyper-inflate the price. This figure isn’t worth with that, not by a long shot. You can buy a lose Flash on eBay, and some paint at Hobby Lobby, and make your own version at ¼ the cost. So considering nothing new was added to the figure to improve it upon the original; and considering his nitch [kitch] status, I can’t recommend this figure as a purchase to the casual collector unless they have something vested in the character to begin with.